By the end of this month, British Columbians will have chosen new mayors and councils all across the province. A sizable number of incumbents decided not to seek office again this year, opening the door for what will seemingly be very different municipal governments. In Metro Vancouver alone, more than half of mayors will not see their name on the ballot this year – including those in the two most populous municipalities: Vancouver and Surrey. Voters in Burns Lake, Nanaimo and Ucluelet will not have a chance to re-elect their mayors. Many reasons have been outlined for the exodus of incumbents. One of them is indubitably the changes in campaign finance legislation brought in by the current provincial government of British Columbia. Without the benefit of (over the table) corporate and union donations, it is practically impossible for incumbent mayors to run the same type of campaign that they ran four years ago. In larger municipalities, signs and door-knocking have already replaced targeted media advertisements. Another issue that may have altered the plans of incumbent mayors is the change from three-year to four-year terms that became effective in 2014. This modification could have turned off politicians who still wanted to serve their communities but were not ready to make a commitment until 2022. But aside from campaign finance and term duration, there is another hindrance for incumbents that is closely connected with the political developments we have seen over the past two years in Canada and the world. The electorate has become increasingly critical of whoever is the current holder of the top job. This sentiment has manifested itself in unexpected victories for minor parties and independent candidates. Last year, Emmanuel Macron became president of France after an election where neither of the two dominant parties in the country’s democratic history – the Socialists and the conservatives rebranded as Republicans – made it to the run-off. Macron led a party that had existed for just two years and defeated a far-right candidate, shattering political assumptions. This month’s election in Quebec also serves as a cautionary tale for politicians seeking a fresh mandate. The campaign did not feature the perennial discussion about sovereignty and Quebec’s place in Canada. In addition, only 9% of Quebecers who responded to a Research Co. poll said the main issue facing their province was “the economy and jobs.” This is a significantly low incidence of financial angst in the latter stages of a provincial campaign. The Liberal government of Philippe Couillard posted a billion-dollar surplus, only to be shunned by voters. When all ballots were tallied, the Coalition Avenir Québec secured a majority government, after 68% of voters said it was time for change. The France and Quebec examples outline electorates that were ready for something different, even if there was a lack of clarity about plans and policies. Municipal elections have other features that must be taken into consideration, including lower voter turnouts, fragmented media coverage and issues that vary greatly across regions. Still, there is a sense among many voters in the early stages of British Columbia’s municipal campaigns that things are not headed in the right direction. A provincewide poll conducted by Research Co. last week shows that almost half of British Columbians (46%) do not like where their municipality is going and believe it is time to change course when it comes to their local government. There is no gender gap when it comes to the animosity toward incumbent municipal administrations (47% among men and 45% among women). But majorities of British Columbians aged 35 to 54 (53%) and 55 and over (51%) agree with the notion that things are not going well. 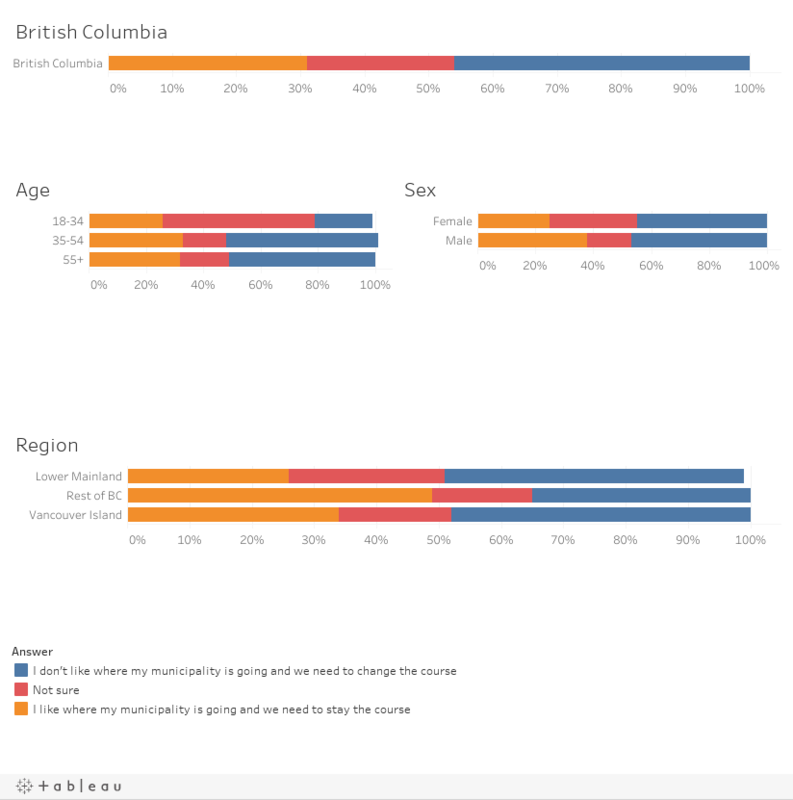 Most millennials are undecided, particularly outside of the Lower Mainland. Regionally, mayors and councils in the Okanagan and northern B.C. can breathe a little easier this time around. Almost half of residents in these areas (49%) claim to like where their municipality is going and believe no change is necessary. The situation is more dire for incumbents on Vancouver Island and in the Lower Mainland, where 48% of residents think it is time for change. This municipal campaign is already more complicated than previous ones. New parties are emerging in some areas, and independent candidates have filed their paperwork in record numbers. There is a palpable anger against specific decisions, depending on whom you ask and where.